This Hershey’s Kisses and Hugs XOXO Merchandising demonstrates you really shouldn’t sell one without the other. At least not for Valentine’s Day. And regular solitary Hershey’s Kisses may be relegated to cases of one-directional unrequited love. Packaging here shows the chocolate treats are shaped XOXO to suit the the common abbreviation of “hugs and kisses.” If you are military, you may read this XO as Executive Office. 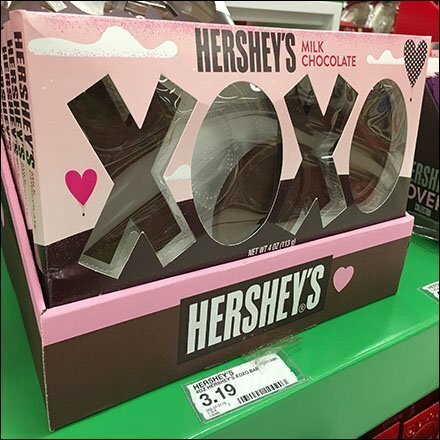 This Hershey’s Kisses and Hugs XOXO Merchandising seen at Target.